Well, this book is the very definition of heart-warming. It seems to fit really well with this time of year. It’s not a Christmas book but it makes you feel all warm and fluffy and is perfect for curling up in front of the fire of an evening (not me, I’m always too warm to have the fire on but you get the general impression). Lucy, as you might expect, is the main character but actually it’s very much an ensemble piece. 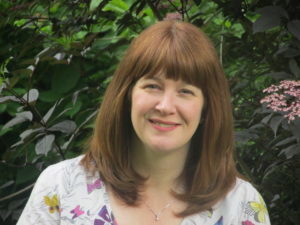 Lucy works as a librarian and inevitably comes into contact with people who may be lonely or struggling with life, seeking companionship at the library. She runs this little book club consisting of herself, Lia, Callum, Oscar and new member, Hattie. Each of them has their own little story going on and for whatever reason their home lives are not that easy. Each character is really likeable. Perhaps my favourite might be one that I haven’t mentioned – Jasper. He is part of Lia’s story and I really liked his personality. But I liked everybody and was rooting for them all to get what they wanted out of their lives, including Lucy, who wants to be a writer. The ending was rather clever, I thought, as Lucy’s ambition becomes a real part of the story. I didn’t know this book had dug so far into my soul until something happened that caused unexpected tears from me and I realised that the characters had become like friends. It’s such a sweet, gentle story and one that I think cannot fail to charm the reader. 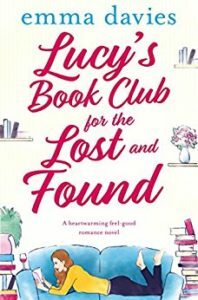 Lucy’s Book Club for the Lost and Found is available now from Amazon UK and Amazon US. 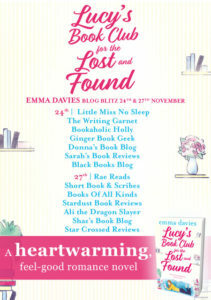 And please do have a look at the other blogs taking part in the two day blitz. It is, I think you would like it.